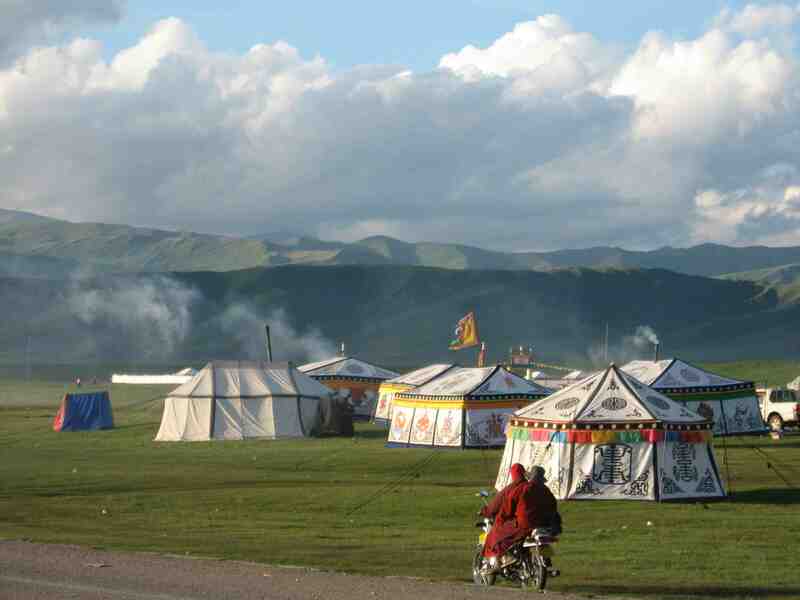 When I visited Tibet in 2001, I frequently performed ceremonies outdoors. On one occasion, thousands of people gathered in a high, beautiful valley. It began to rain — just a light drizzle — but at 13,000 feet, any precipitation turns the weather cold. Fifty of us were under a brightly decorated traditional Tibetan tent that also protected the ritual implements, paintings, and shrines. Most of the other people were sitting on the grass. The ceremony lasted for many hours. In spite of the weather, everybody seemed happy for the opportunity to be together. Although there were many babies and children in the crowd, none were crying. Many of those present were nomads, and they already knew that complaining isn’t a very helpful state of mind. Their response to complaint is usually just to laugh, because there is never much they can do to change their environment. The Buddhist teachings emphasize that being grateful for what we have is more beneficial than complaining about what we wish were different. Appreciation is a relaxing and peaceful state of mind. It creates a space in which we can accommodate the vicissitudes of life and even think of the welfare of others. Complaint, on the other hand, is frustrating and painful. There’s an element of anger and fixation involved. We are believing our thoughts, taking them to be real. Our attachment to the concept of how we want things to be is stressful, because it is always disintegrating. What we wanted to happen is not happening. We think complaining is going to get the world back on our track. It results in our being deaf, dumb, and blind to the present moment. Narrowing our mind with complaint is unpleasant and claustrophobic, the opposite of contentment. When we complain, we’re saying the world needs to change in order for us to be okay. If only our parent or partner would behave differently, if only the food were better, if only there were less traffic, if only the service was quicker — then we’d be happy. There’s always room for improvement, of course, but seeing how we could make things better is different from expecting the world to cure our inner dissatisfaction. Asking outer conditions to make us okay will never bring happiness, because outer conditions are always changing. We are asking instability to bring about stability. According to the law of karma — cause and effect — that’s impossible. When we’re asking for the impossible, the world can never be good enough, and we’ll always be complaining. Why is it that one day something hardly bothers us, and the next day we’re complaining about the same situation? We haven’t yet found the peace that comes from resting within the inherent stability of our mind. That’s really what we’re complaining about. Complaint is the byproduct of an untamed mind. Because we’re unable to relax, we’re not in tune with the environment. Our fantasy of how things ought to be is colliding with how things really are. No wonder we’re grumpy. We’re fixated in our complaint, imagining that it’s “me,” and setting ourselves up against the world. This is unpleasant for us as well as others. Nobody wants to be around somebody who is constantly complaining. Why? Because when we complain, we are looking only for our own comfort. Complaint is rooted in self-infatuation. Self-infatuation gives birth to negative emotions. When our mind is in their possession, we start complaining. What emerges might not be as overt as anger, jealousy, or desire. It might be a subtle undercurrent of discursiveness. 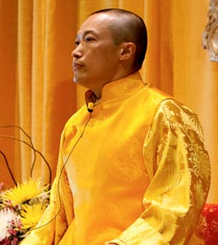 Negative emotions — nyonmong, obscurations — are temporary experiences. When we engage in life with self-centeredness and negative emotions, two things happen. We bring about more pain and stress for ourselves, and we hurt those around us. Nobody gains from nyonmong. Maybe the waiter brings food quicker, but now he is irritated as well. With everyone’s mind in a closed state, we’re not able to fully appreciate our meal. One of the first teachings that the Buddha gave was to point out the ongoing suffering of everyone. We live in a world that is always suffering, in both minor and major ways. Under these conditions, the world is set up for constant and all-pervasive complaint. Because everything suffers, we could be complaining about everything all the time, trying to make right what is seemingly wrong. If we can relax our mind instead, we might see the humor in how the world works. Running around trying to alleviate our suffering obscures our true nature — basic goodness — which is clear and unchanging. When we take the path of complaint, each complaint lays the ground for the next complaint and nothing gets any better. Thus the cycle continues. That is the meaning of the word “samsara” — circular, always feeling the rub of suffering and then looking for a way to make it go away. The remedy for samsara is a reality check. Realizing that the world is in constant pain and turmoil, we can be preemptive, acknowledging the truth of suffering instead of trying to avoid or assuage it. When we meditate, we are training our mind to relax into the fact that there is always something to complain about, and that complaining about it is not going to bring peace or happiness. It is strange, but true — recognizing the ongoing and all-pervasive nature of suffering can take us toward contentment. If we can learn to relax our discursiveness, we will find that underneath it all, we are already happy. The technique of recognizing, acknowledging, and releasing thoughts and returning to the stability of our breath helps us see that the frantic agitation of complaint is an unnatural and temporary state. The wisdom and love beneath the clutter of negativity is natural and permanent. In discovering this space, we are spawning a new relationship to our life. We are switching tracks. Instead of obsessing with our own satisfaction, we begin to see what is going on with others. Out of that evolves less desire to complain, and more desire to be of benefit. Instead of complaining that somebody’s not moving quickly enough, we can relax and open our mind. We are instigating a positive cycle. We can see that she needs help, and so we help her. This is how life becomes joyful. We are breaking free from our completely contrived preconception of how things ought to be. We are relieving our mind of the burden of complaining. We are no longer draining our life-force energy in a fight with our environment. We are coming out of our shell of self-obsession. Not complaining doesn’t make us docile, just accepting of whatever comes along. It puts us in tune with how things are. Now we’re able to be proactive, as opposed to reactionary. Freedom from complaint brings joy. Our life is no longer made of attempts to have the preconceived perfect day. Just like those nomads, we can relax with a light, cold sprinkle on our face and smile, because our heart and mind are big and warm. We can appreciate being alive. We know that we are here to help the world — not to complain. We know that when we relax into our goodness, there’s nothing to complain about.